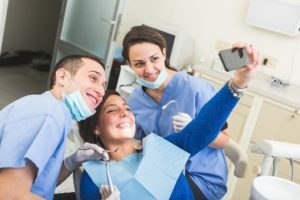 How to Find the Best Dentist in Midlothian Today! Are you looking for a new dentist in Midlothian? Do not choose just anyone. You have unique oral health needs that constantly change over the years. Not to mention, you expect a certain level of care and comfort during your appointments. As a result, not all will meet your needs and expectations. To make a wise choice for your dental care, there are several things to consider when choosing a new dentist. Which Dentist Do Your Friends and Family Use? You can often find a great dentist by asking your friends and family for recommendations. This will provide you with a short list of potential dentists who may be able to meet your needs. Do They Offer Complete Services? After you have a list of dentists, take the time to look at each one’s website to review their services. In addition to general dentistry, look for one who offers specialty care, like dental implants, periodontal therapy, or TMJ therapy. This will help to ensure that all your needs will be met from one location, even as your dental requirements change over the years. The services a dentist offers must be supported by qualifications and experience. In addition to earning their dental degree, look for one who has continued advanced courses or regularly continues their education to remain well-versed in the latest dental advancements. Nowadays, you can learn a lot about a dentist by taking the time to read online reviews and testimonials from their current patients. Often, you can find them right on their website or you can conduct a simple Google search to see what others have to say about the dental practice. You need a dentist who has a convenient location and office hours to make scheduling appointments easy. With hours that accommodate your daily responsibilities, you are more likely to maintain your dental visits. How is the Environment and Staff? In addition to the services you receive, you also need to feel comfortable when visiting the dentist. Prior to scheduling an appointment, take a tour of the dental office to checkout the atmosphere and the friendliness of the dental team. To ensure that finances never stand in the way of your dental care, you need a location that offers affordable services. In addition to working with your dental insurance, choose one that offers an array of payment options or financing plans. With the right research and careful consideration, you will make a wise choice for your dental care. Take the time to review all your options before making your final decision. Long Family Dental provides comprehensive dental care to the community. With a focus on the oral health and satisfaction of our patients, we create personalized treatment plans for all stages of life. If you need a new dentist in the area, choose the dental care you deserve. Contact our office today to schedule an appointment.